**AVAILABLE WHOLE BEAN ONLY** Raw Microlot beans aged for 8 weeks in a Kentucky Bourbon Barrel. Then roasted in small batches. Taste: Rich and complex with flavors of dark chocolate, concord grape, oak, and sour mash whiskey. Full-bodied with a never-ending finish with notes of dark amber maple syrup and toasted malt. 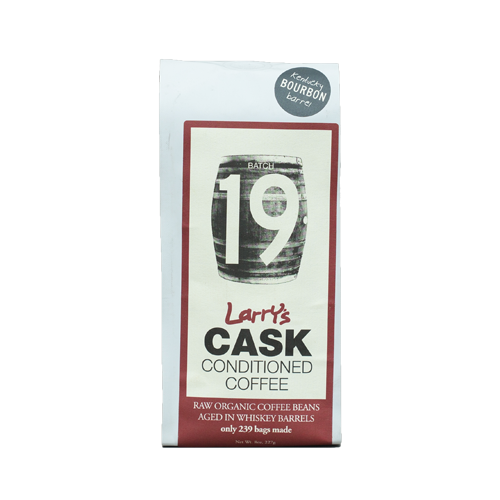 Rich and complex with flavors of dark chocolate, concord grape, oak, and sour mash whiskey. full-bodied with a never-ending finish with notes of dark amber maple syrup and toasted malt.